Take a look at this. What does this look like to you? If you said that it looks like rich, chocolatey decadence: you are correct. 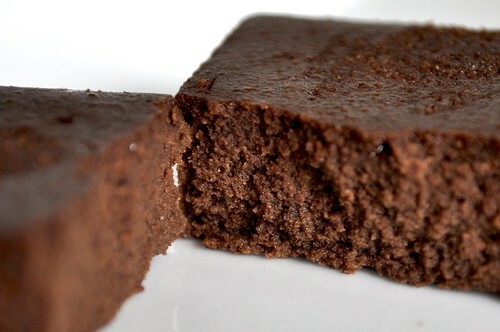 If you said that it looks dense and moist and delicious: you’d be right again. 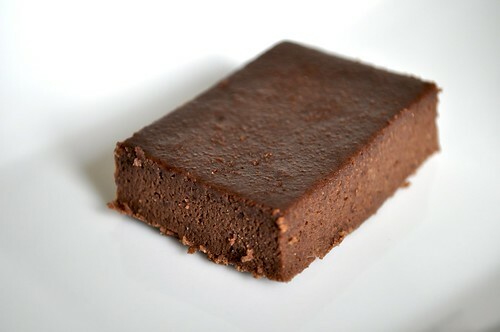 If you said it looks like a sensible, fiber-filled, protein-packed dessert option: well, then you are probably already on to my little secret. Okay, it’s not really my secret. If you watch the Dr. Oz show or have the Whole Foods iPhone app, you may very well have seen this trick before. By the way, if you have an iPhone, the Whole Foods app is really a lot of fun. It allows you to locate stores, create shopping lists and search for recipes by category—one of which just happens to be gluten-free. Oh, and it’s free. You can’t go wrong with free. The secret here? Black beans. I kid you not. This method has been a complete revelation for me and I’m actually a little disappointed in myself that I didn’t think of it on my own. 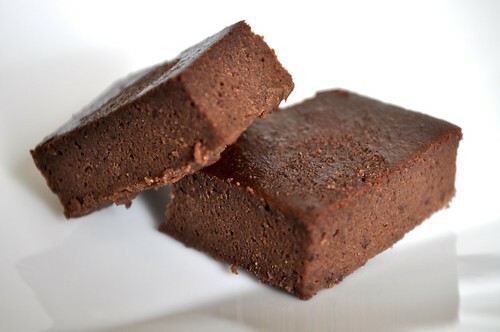 The beans add structure and bulk to the brownies, all while retaining their wonderful nutritional properties. And it really couldn’t be easier. You literally throw everything into a food processor or blender, give it a whirl, and bake. Done. I intend to run far and wide with this idea. Because I love beans. And I love dessert. And the two of them together equals a tasty treat sans guilt, which I know we’re all looking for more of. The original recipe calls for the addition of chocolate chips and walnuts. I wasn’t feeling nutty and, for maybe the first time ever in the history of our relationship, Chris wasn’t feeling chocolate chippy. I probably should’ve taken his temperature. In any case, they were delicious without these additions. I should also mention that, despite greasing my baking dish very well, the brownies still stuck pretty badly. They popped out mostly intact, but left a layer of brownie goodness behind. And we can’t have that. So, in addition to greasing, I will be lining my dish with parchment on the next go. And there will be a next go. 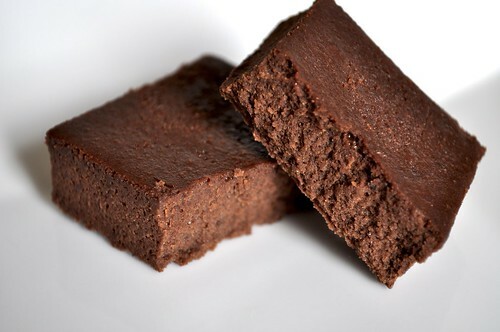 Because, bean or no beans, these brownies are every bit as good as they look. Add the black beans, eggs, melted butter, cocoa powder, salt, vanilla extract and sugar to a food processor or blender and puree until smooth. If using, stir in the chocolate chips and walnuts. Pour the batter into a well-greased, parchment-lined baking dish. Bake for 30 to 35 minutes in an 8×8″ dish or for 25-30 minutes in a 12×8″ dish, until just set in the middle. Allow to cool completely before cutting and serving.